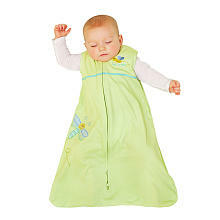 When I was in the hospital two weeks ago having my daughter, I got a really nice gift from the hospital - a HALO SleepSack! I LOVED that they gave me this as a gift because I am a HUGE fan of HALO and their SleepSacks! Now I get the privilege of introducing to you their newest product: the HALO Safe Sleep Crib Set! With the American Academy of Pediatrics now saying “no” to crib bumpers, HALO Innovations has introduced its own Safe Sleep Crib Set designed to create an attractive and safe sleep environment for babies. The five-piece HALO Safe Sleep Crib Set consists of a HALO SleepSack wearable blanket, SleepSack Swaddle, both in 100% cotton; two coordinating crib sheets in soft cotton jersey; and a matching crib skirt. Designed with whimsical prints, the HALO® SleepSack Crib Set will help create a beautiful and safe nursery for your little one. The set comes in six patterns including pink, blue and neutral tones. I just love that HALO has come up with a whole crib set that is super cute but also really safe for all babies! I love the designs you can choose from - they have cute designs for girls, boy, and neutral designs - and they are all cute. I especially love the caterpillar print that I received!! As always, the HALO products are super comfy for your baby and will keep them warm and the swaddle will give them that womb feeling of snugness! This crib set is perfect as a gift for a baby shower or to any new parents. It has everything you need for a baby's bed - even a super cute matching decorative skirt! With this crib set, you won't need any blankets, bumpers or other crib accessories! You can decorate your nursery around any of these cute sets! Buy It: You can purchase the new HALO Safe Sleep Crib Sets on amazon.com and babiesrus.com. They're coming out with some of the most adorable prints and patterns now! Makes me wish my little one still wore sleep blankets!